With the nuclear sabre rattling mounting in North Korea, its hard for old fears not to be renewed. 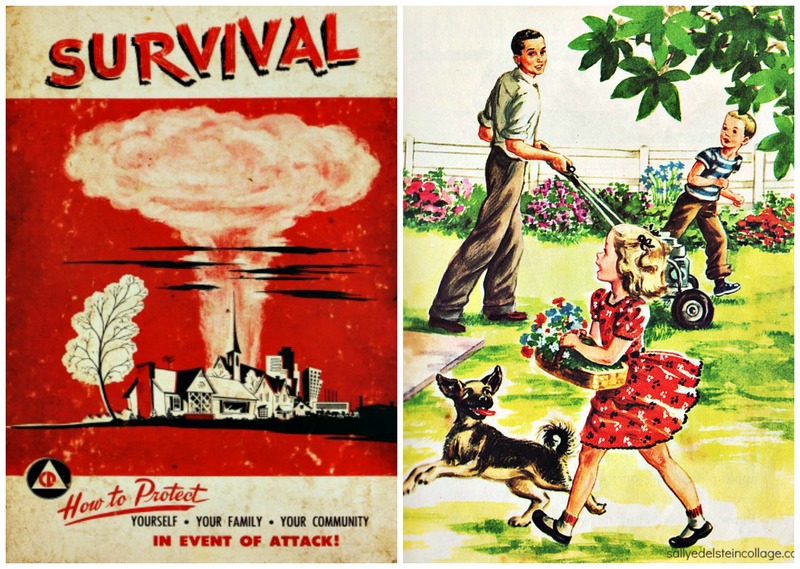 For those of us who grew up during the 1950’s and 1960’s the fear of nuclear attack was the subtext of our lives. Nothing matched the profound fears that gripped our country’s fear of a cold war turning hot. It was a time when most Americans assumed the U.S. and the Soviets stood continuously on the brink of nuclear war. Memories of growing up duck and covering didn’t just flood back – they are always lurking in the recesses of my mind. 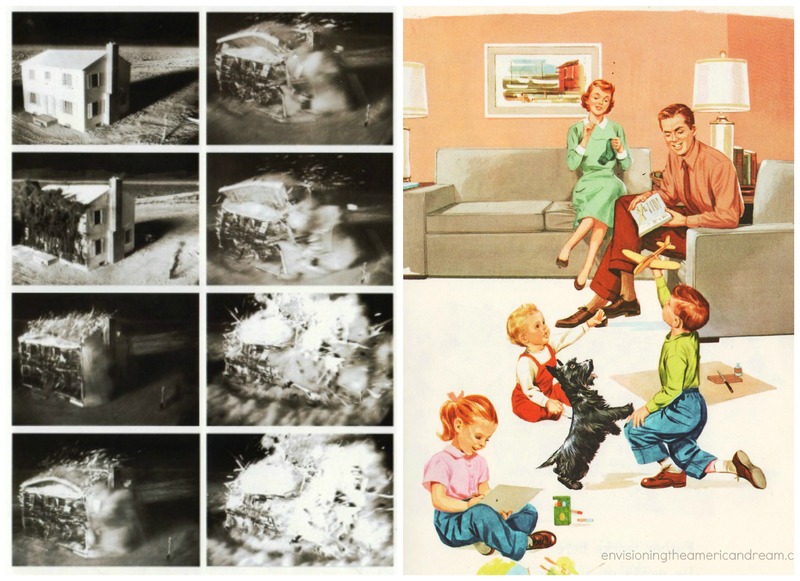 (L) A public service newspaper ad produced by the Advertising Council, advising mothers to be prepared with an assortment of first aid materials should a nuclear bomb attack occur. (R) A government illustration superimposing an Atomic Bomb Test over the NYC skyline to indicate the scale of the blast. 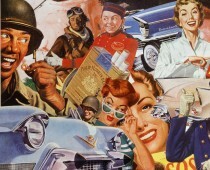 Fueling our prodigious fears was the emphasis on Civil Defense and the governments zeal in educating the public about the risk of an atomic attack- how you could survive one, and how to plan and pack for the few days you and your family would have to spend in your fall out shelter. Lucky for me my own Dad was well versed in the art of preparedness, a lesson I would learn at the tender age of two. 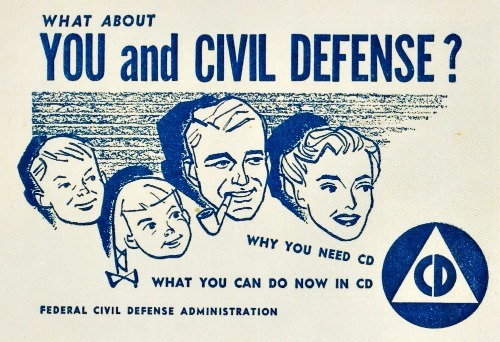 If it was a Wednesday night in 1957, it meant Dad would be out for the evening at his weekly Civil Defense meeting. My father was Marshall of Civil Defense for all of western Nassau county – and part of his job was conveying helpful information straight from the Department of Defense to groups of concerned citizens with a good case of atomic jitters. These evenings were exciting for Dad and it was flattering to be summoned to speak before groups and large public gatherings, not to mention being courted by The Long Island Press reporters. He gave his speeches in churches, club-rooms, school auditoriums, similar to the hundreds of public meetings that gathered all over the country for the same purpose. The audience listened intently, a dense cloud of fear enveloping them as they drifted off into the seemingly safety of the quiet suburban night. In reality these talks did nothing to dampen fears, and only underscored how very unprepared we were. It was, the perfect suit in which to deliver his Civil Defense talk. Despite the fact that he had gone over his speech all weekend with Mom till her poor eyes glazed over, he still seemed in need of an audience to practice just once more. With Mom indisposed preparing dinner, mine were the only willing set of ears in the house. Captive in my crib, Dad delivered his speech to me with the intensity of a campaign stumper. 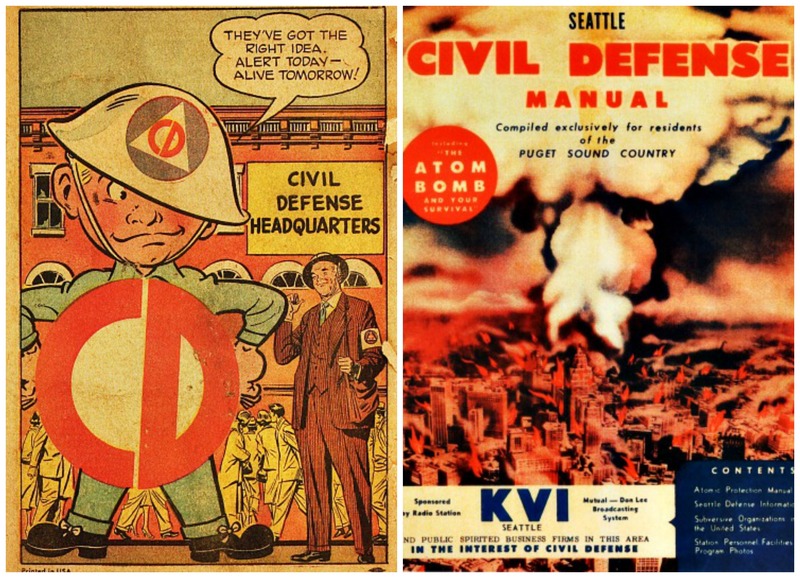 Rustling his papers, he began his lectures as he always did, stating the obvious- Civil Defense was Common Sense. The government provided him with lots of snappy phrases like, “Alert Today, Alive Tomorrow” that peppered his talks with the persistence of a Pepsi jingle. Slapping the side of the crib to emphasize his point, startled me and I began to cry. 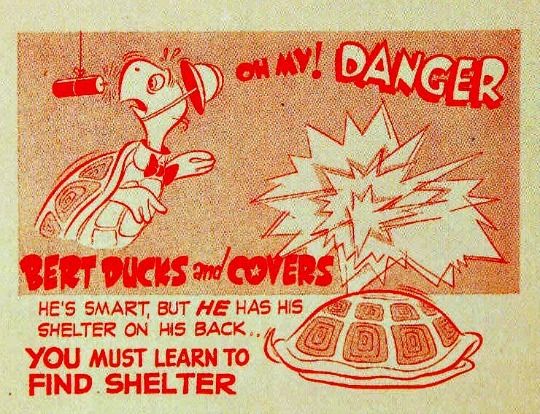 Kissing me gently as he left, he tickled me and whispered “Civil Defense is Common Sense.” Snug as a bug in my crib, my own private fall out shelter, I clutched Tuggy the Turtle with his unbreakable shell and giggled in delight. This reminds me of the closing of “Dr. Strangelove”. What a great movie. One of my all time favorite movies, I watched it this past New Years Eve as an eerie portent of things to come in advance of a Trump presidency.